The Wanderer's Journal: Obsessive. Compulsive. Addictive. I did not open my laptop for few days. 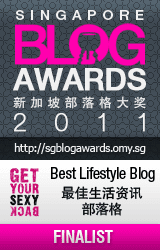 I have not blogged for a while. I was rather busy over the weekend. I was so busy enjoying my new handsome big baby. I was so occupied watching the brand new TV in our room! I can blog now because I took unpaid leave today. The flu bug has really been bugging me since Friday and left me super tired this morning. Our new big baby is home! After we attended the M1 Workshop on Saturday morning, my husband and I took a walk at the mall next to the Novotel Hotel, Clarke Quay. We just wanted to have a look at the mall and had lunch there. After lunch, we went upstairs and just trapped in this giant electronic shop. A real electronic heaven for my husband. I can literally saw the sparkles in his eyes and the excitement on his face when he was looking at those massive television displays. We were there for nearly two hours, just browsing stuff from front to back and asking questions to the promoters from all sections. I actually had a purpose of hunting a TV for our room. All this while, our consideration of buying TV would of course be the extra money that we have to spend for purchasing one plus the fact that we were so used of living without a TV. However, I just felt that having a TV at home could make our life a little bit humane. Something to entertain us, other than just getting online almost from am to pm. After a lot of thinking, long discussions, annoying confusions (from me) and consultations with the sales promoter on almost every item plus a further S$ 100 discount from the seller, we decided to bring home a 32-inch latest model of Toshiba's LCD. Lucky I had my husband who knows almost everything about various kind of electronic stuff (from TV to GPS) and he really knows how to fix electronics too. My parents said, "Just buy it if you want". They also commented that a good TV is a good investment too for our real permanent house in the future. For a moment I felt guilty for spending S$ 499 (for the TV) plus S$ 69 (for the DVD Player) for luxury things - that are not urgent nor important, but for most of the time after we made the purchase, I felt joyous and happy. I could not believe that we bought a big TV for my husband and me. I felt like a real independent adult. So, welcome home, Toshiba! Now, I can't imagine the situation when both of us have to relocate to a new place in the near future. There are just too much big and small stuff in our room and we keep on buying stuff. And one most important thing following this purchase is to welcome Monk home again! I am so obsessed and addicted to Monk series since my ex-house mates in Serangoon introduced this man and his team to me a couple years back. 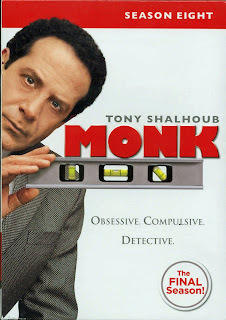 I like Monk's hilarious and genius character. I just can't get enough of his actions. Luckily, my mother in law brought back some of the Monk DVDs that I left in Malaysia yesterday! Now, I can re-play Monk every night again and introduce him to my husband. How I wish I could collect all the nine seasons!